Come join us for a walk along Galveston Bay in the southeastern corner of Harris County, as we stroll through the City of Seabrook’s hike and bike trails. 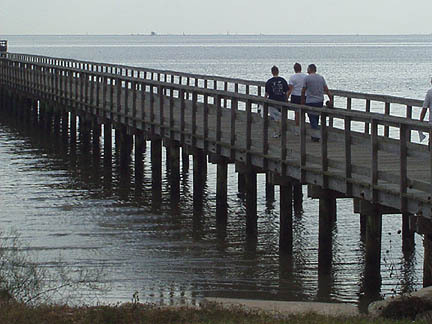 Come stroll down to Galveston Bay and walk onto the fishing pier. This is not a speed event. You are encouraged to bring along your children and walk/talk and spend some time together enjoying the great outdoors. All are welcome to come walk with us. START TIME: 9:00 – 12:00. Walkers must be off trails by 3 p.m. This is a Volksmarching event and you will need to register to get a start card. We request a $3.00 per person donation to help defray the cost of hosting the event.